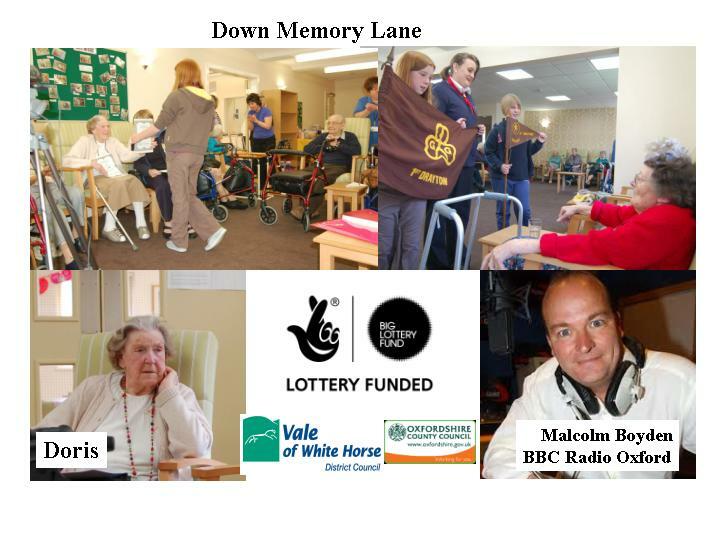 We have been preparing for the Down Memory Lane activities and events that start the week of the 16th April. On Thursday 12th April at 11am Doris Hurley (Chair of the Oasis & Abingdon Resource and Wellbeing Centre members group) and myself (Sharon Woodward) were interviewed for local radio. The BBC Radio Oxford Malcolm Boyden show. Doris was wonderful and it was great that the local station were so supportive in promoting this project. I had to smile when Malcolm Boyden attempted to tease Doris. He joked about her being a movie star at 86 and then asked, had she consider being in the new James Bond Film? It was excellent when she responded with 'Yes' that she wouldn't mind volunteering to help them out. Well today the Down Memory Lane Project really got started. We were treated to a visit by the Drayton Brownies, they sang a number of songs including ‘We’ll Meet Again’. They also had a number of interesting questions to ask. The young people asked the Senior Citizens how life had been different when they were young. The questions covered things like getting up and going to school without a hot shower or Central Heating. Traveling to and from school and how they would learn once they were at school. Learning was not done via a computer, the games that were played had been very similar or the same. They spoke about after school activities as television was not around and learning to saw and knit were the favorite pastimes. What I found interesting afterwards was the Brownies feedback. One young lady said that she was surprised that they had games in common. Another said she had not realized there had been so many small shops as she was used to shopping in a large supermarket, with all the goods under one roof. Another spoke about Rationing, saying she had been aware of food getting rationed but didn't know that clothing had the same restrictions. Christine Sadler and Jackie Richards.